Welcome to “The Last Resort”! 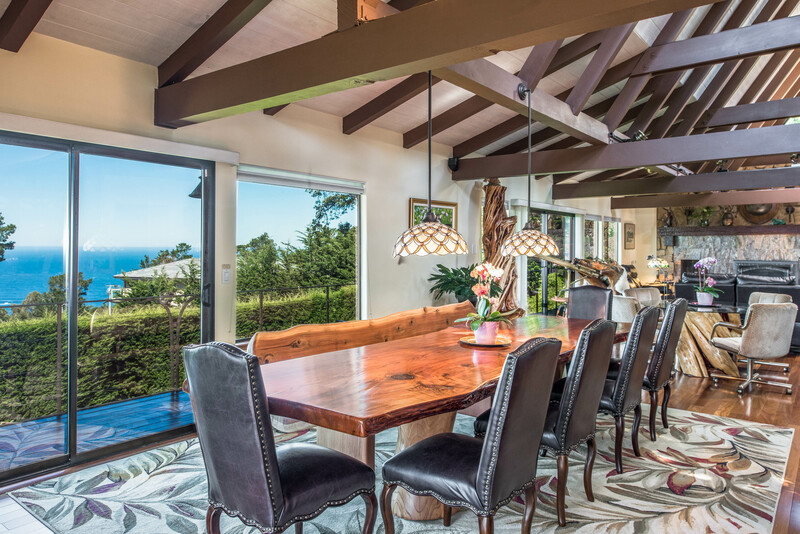 This extraordinary home combines a love of nature and with luxury to create an environment that captures the essence of California coast living. 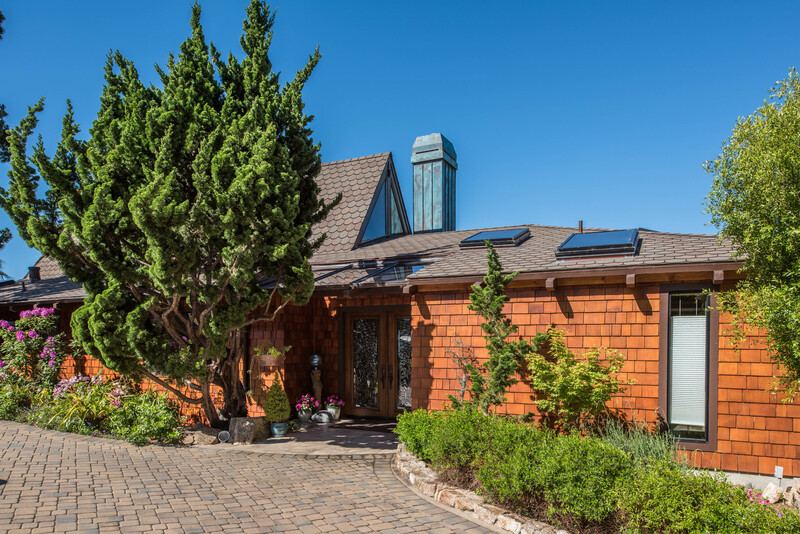 Situated on an acre bluff in Carmel Highlands, this secluded 3,200 square-foot, 2-level A-frame house, with its sweeping ocean and mountain views, has an indoor-outdoor orientation designed to take full advantage of the breathtaking surroundings. 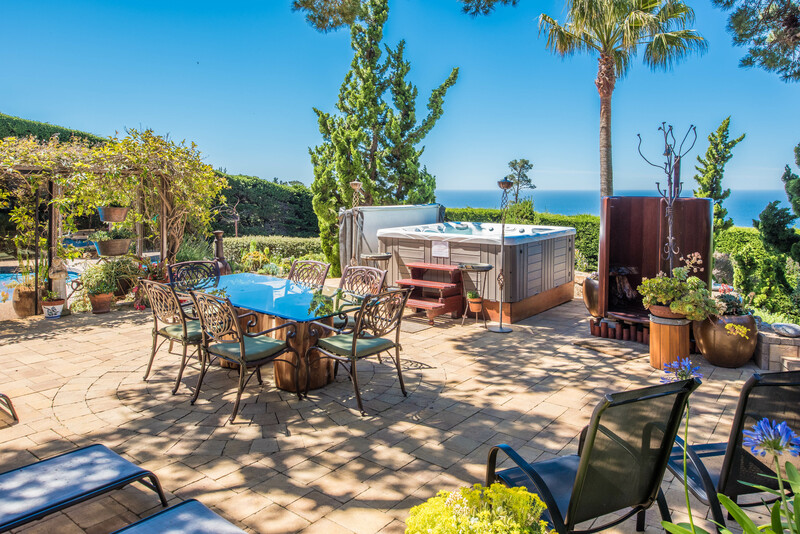 Upon your arrival you will be greeted with tickets for a wine tasting at Scheid Vineyards’ tasting room in downtown Carmel-by-the-Sea and a basket of local information. 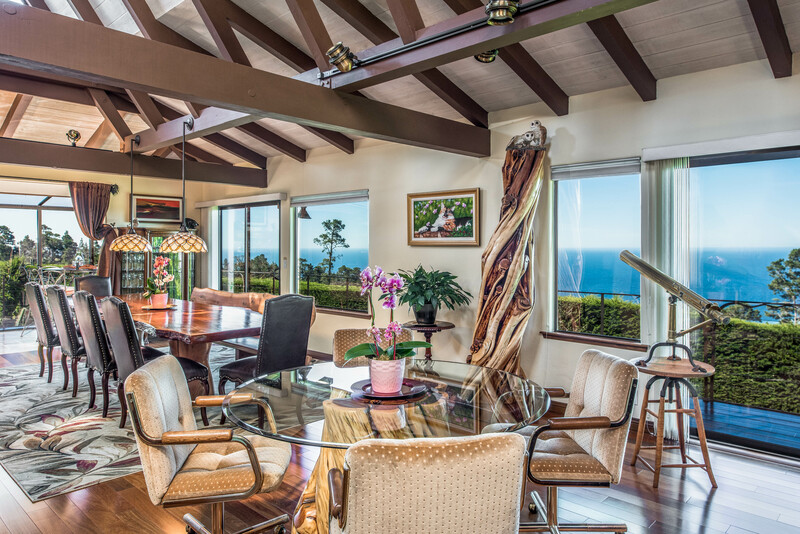 An assigned concierge vacation house manager is available to assist you during your stay. 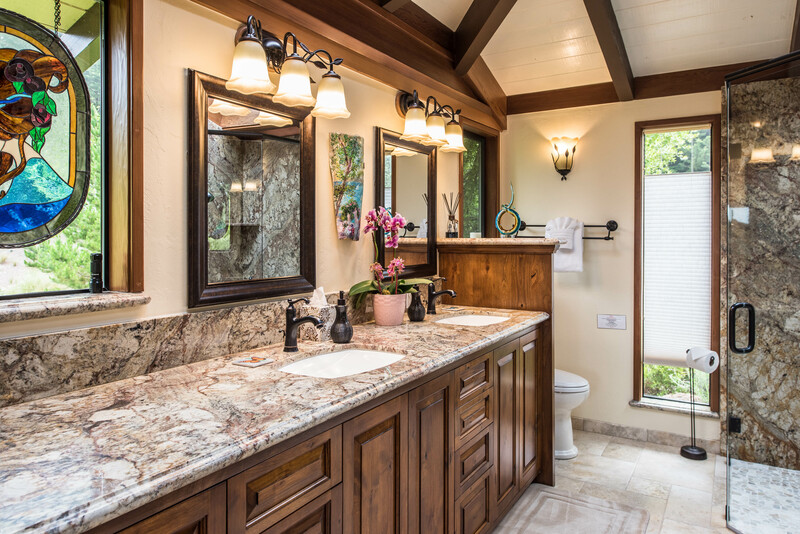 We have also provided spa amenities in the bathrooms and spa robes. 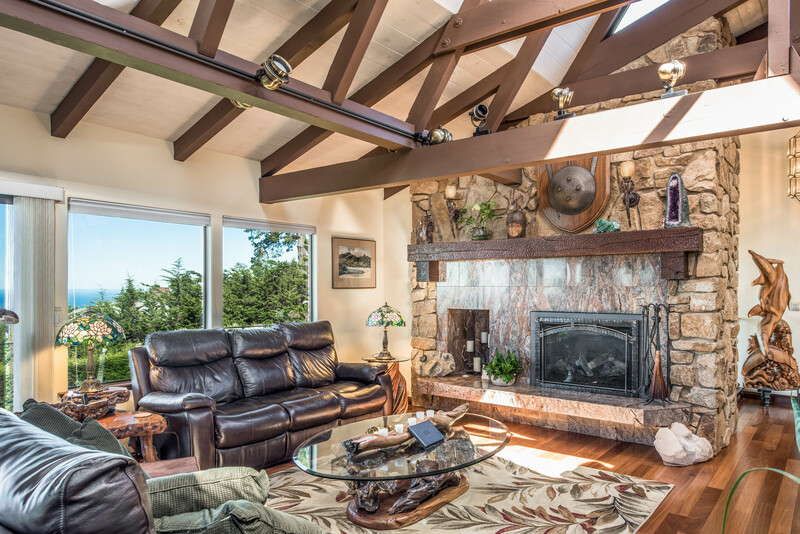 Spacious living areas, with vaulted wood-beamed ceilings, skylights, a wood-burning stove insert (wood provided), a wall of windows, comfortable furnishings and ocean views, are conducive to warm social time. A hedge of Cypress trees guarantees seclusion, while numerous nooks, both indoors and out, provide opportunity for quiet contemplation. And when you want to play, there’s a swimming pool, a fitness room and a game room with pool table and video arcade. 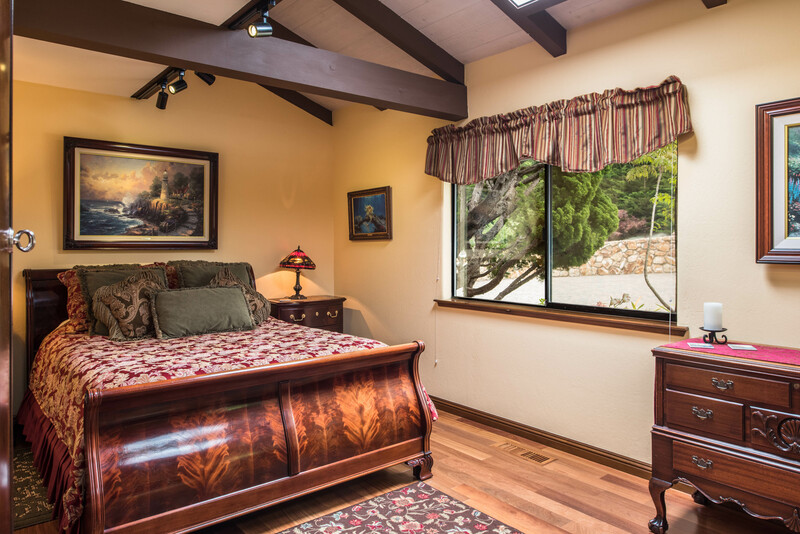 Three generous bedroom suites offer sleeping for 6-10. 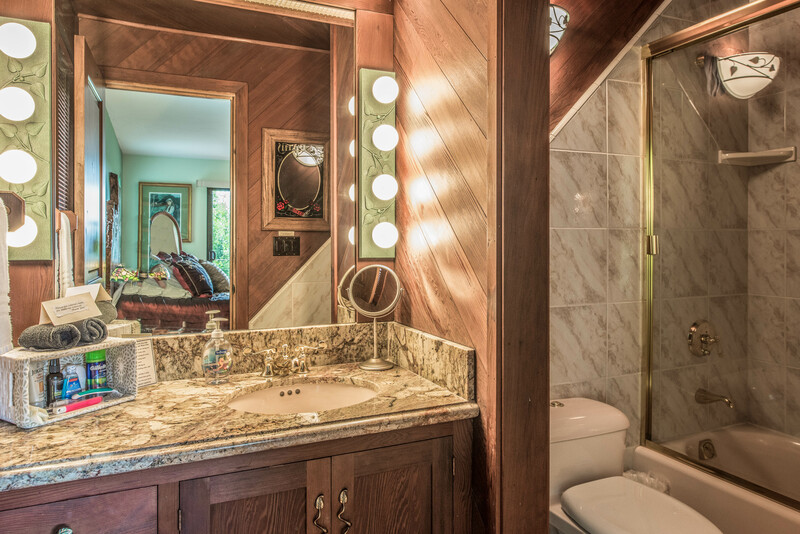 The upstairs master suite features a pellet stove fireplace and private bathroom with walls of rich old-growth redwood, skylights and a separate tub and shower area. 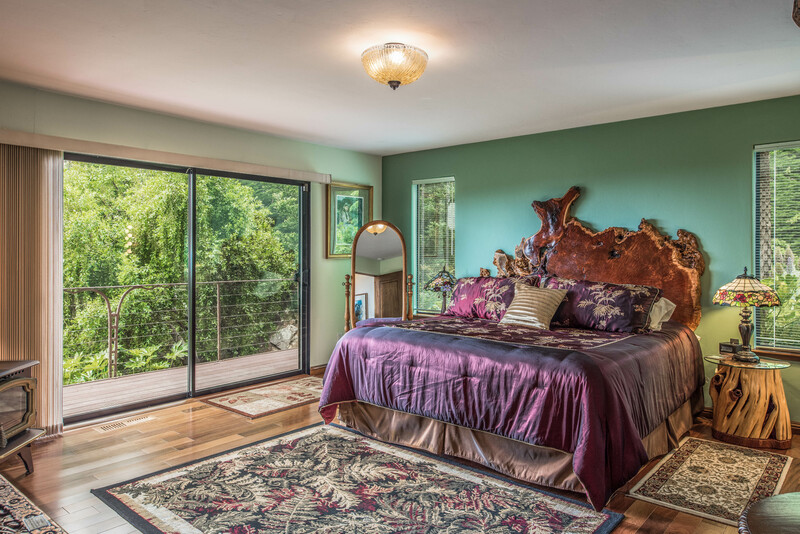 The lower-level master suite has a queen bed, mirrored closet doors, skylights and a private bathroom with shower and tub. 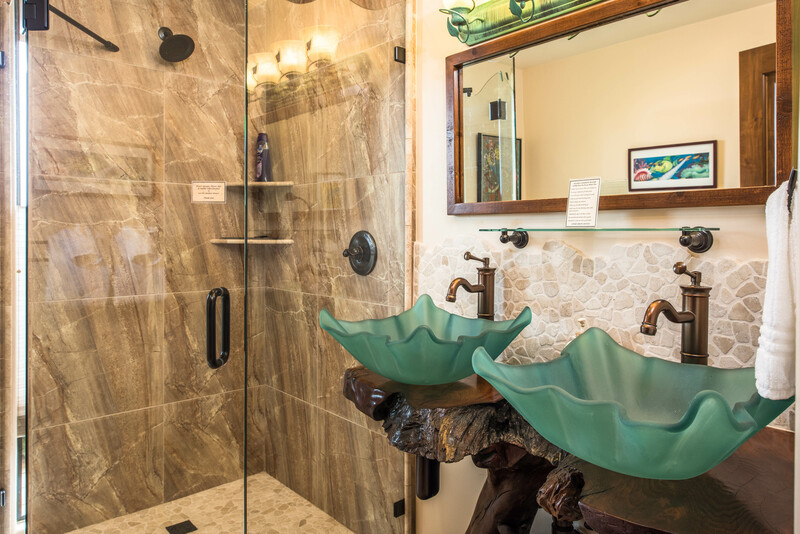 A second guest suite on the upper level has a king bed, mirrored closet doors, skylights, a pellet fireplace and a marble bathroom with a glass-enclosed shower and tub. All bedrooms are large enough to allow for additional sleeping arrangements, such as an folding extra long twin beds with or an inflatable queen bed. 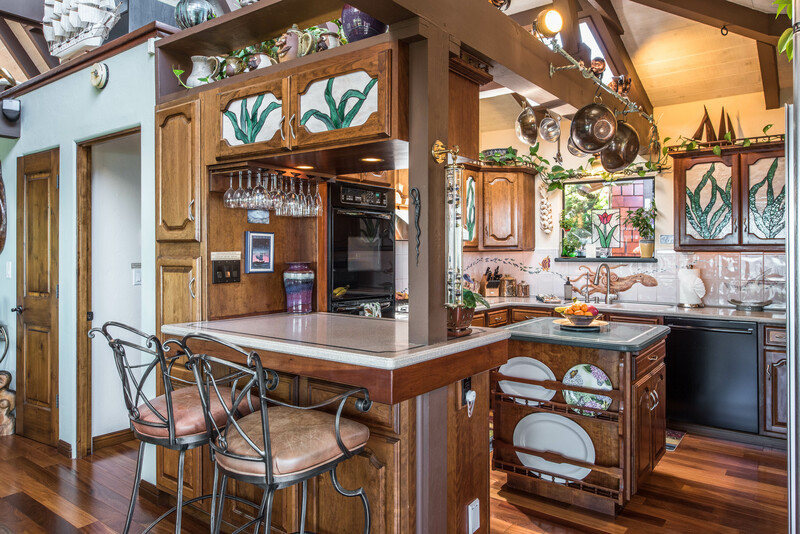 The fully-equipped kitchen has a central island, gas stove, convection/microwave oven, microwave, dishwasher, GE Monogram side-by-side refrigerator and indoor electric grill. An adjacent dining area seats 8. A 600-sq-ft solarium adjacent to the pool houses a fitness room complete with universal gym, free weights, benches, elliptical machine, and an indoor sauna. 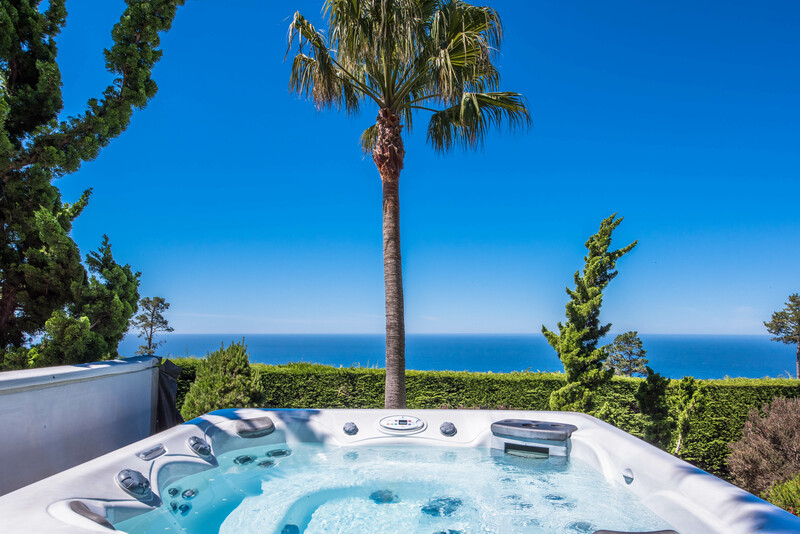 (Sorry, operation of the indoor hot tub is complicated and therefore unavailable for guest use.) The extensive patio and deck includes all the furnishings necessary for lounging and dining poolside, including fire pit and patio heater. 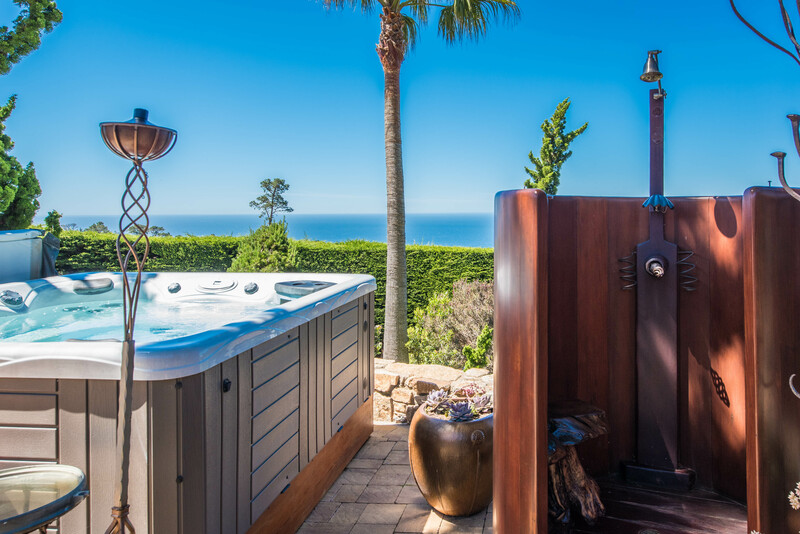 Other special features include an outdoor hot tub, an outdoor shower and a gas grill. 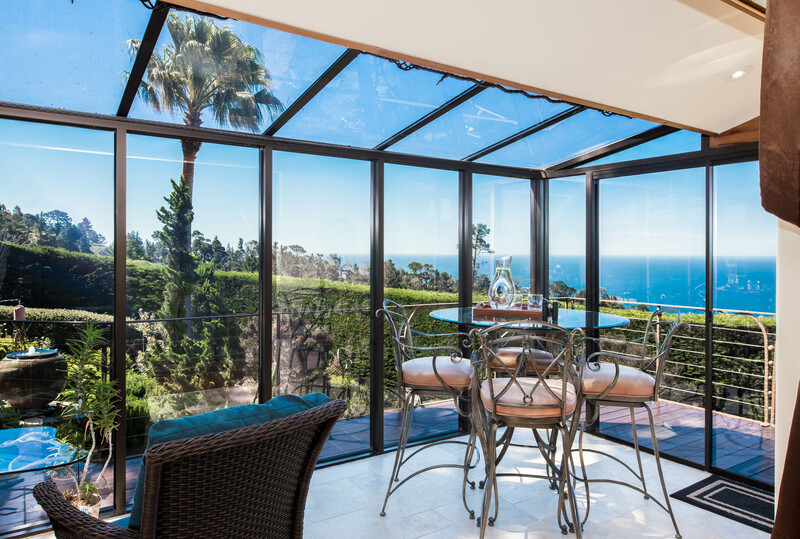 The swimming pool is totally private, sheltered by a hedge on one side, the fitness room on the other and a glass windbreak, which creates a series of framed views of the gardens and ocean. Heating provided by solar panels and the cover make the pool swimmable during extended warm periods of the year, usually April through October. 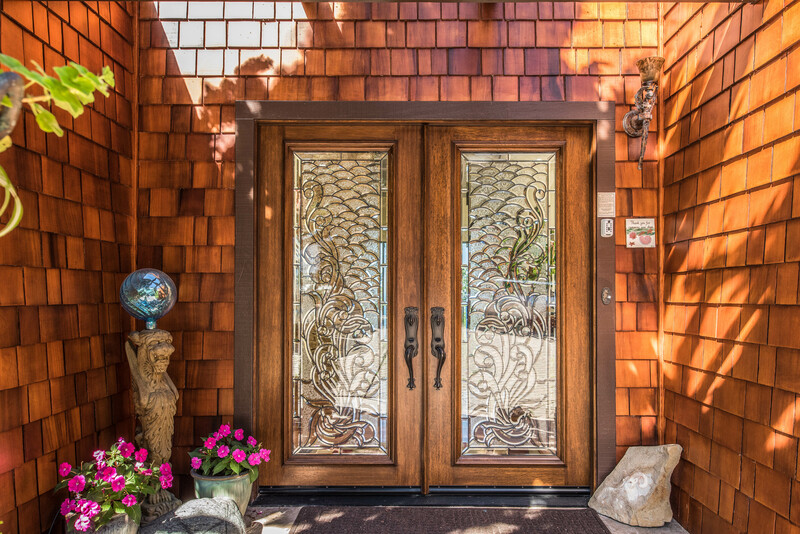 This is a home where the personality and preferences of the owners shine through. Their love for nature is reflected in artwork depicting sea animals, plant life, landscapes and other natural motifs. 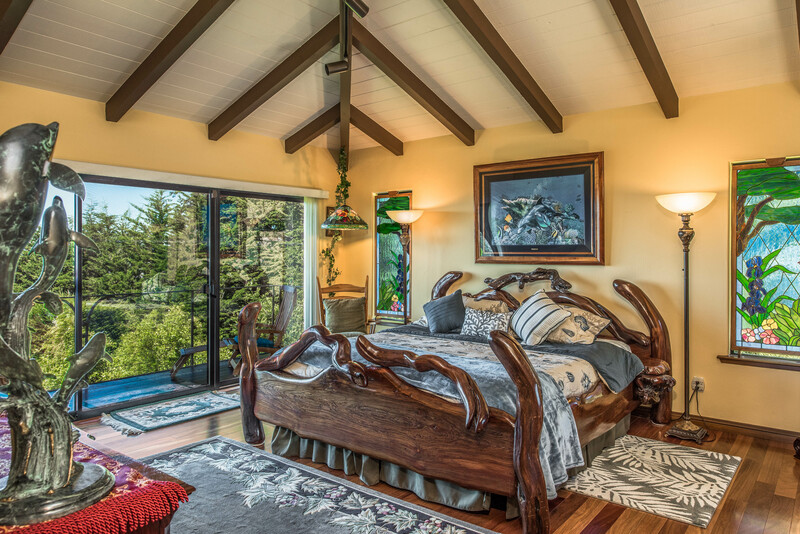 Artisan touches can be found everywhere, from the master suite’s king bed with its undulating wood frame made of tree branches to stained-glass insets in cabinets. The house is equipped with all the latest technology including HDTV Dish Network premium programming, Blue Ray DVD, CD player and library, Sirius Satellite music and a Play Station with several games. It also has wireless DSL connection and phones with unlimited national long distance privileges. There is a washer and dryer and plenty of onsite parking. Please call for current rate information. (831) 373-7103. 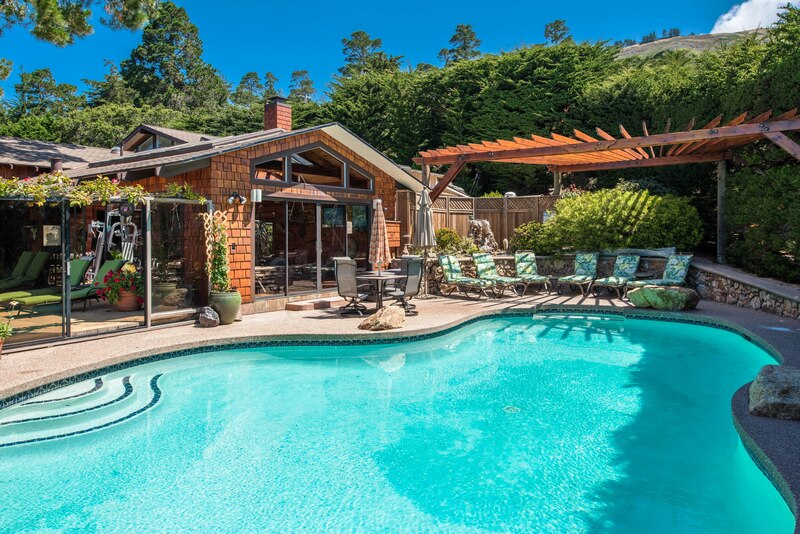 There is a swimming pool on this property. Children should be supervised at all times. 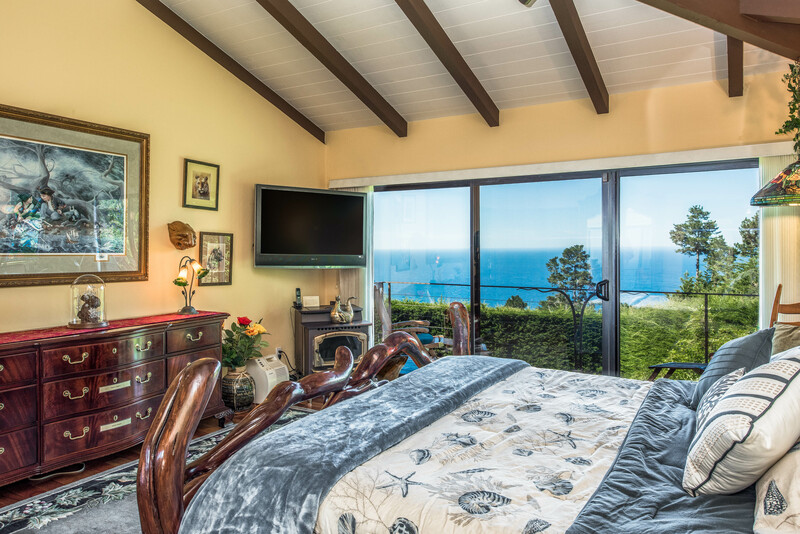 **This home is managed by Sanctuary Vacation Rentals. Guest from Claremont, NH ~ Stayed in August 2015, Reviewed on Homeaway ~ 5 out of 5 Stars! "Pure Heaven! From the Swiss Alps to your beautiful home on the Pacific in 1 week. Does it get any better than that? Top that off with the exceptional weather - and you have the making of a beautiful memory. Thank you for all you did to make this possible!!" Maximum occupancy - up to 10 adults. (Plus limited floor space available for Twin XL folding bed at the foot of the bed or 1 Twin futon cushion at the foot of the bed or 1 or 2 twin futon cushions placed on the left or right side of the queen bed for young children or infants. (Plus limited floor space available at the foot of the bed for a Queen Aerobed or 1 or 2 Twin XL folding beds or 1 or 2 Twin futon cushions. 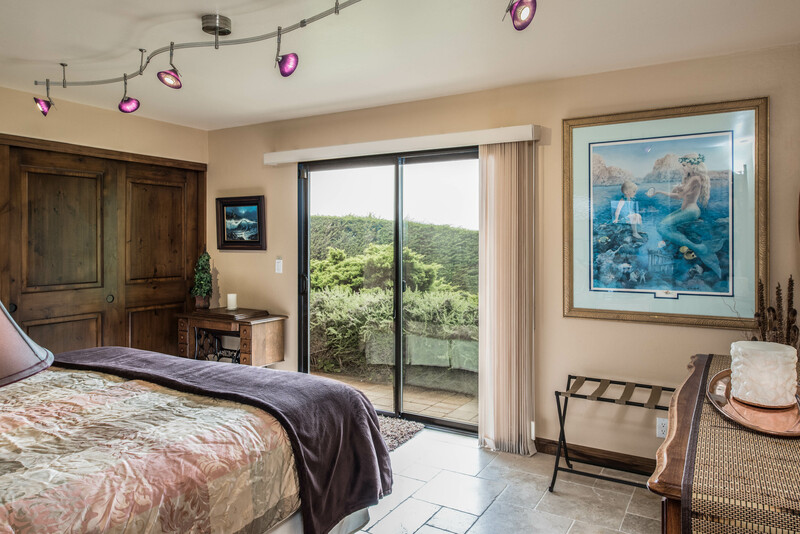 This room has privacy shades, a sliding glass door to deck and has access to a full bathroom down the hall. 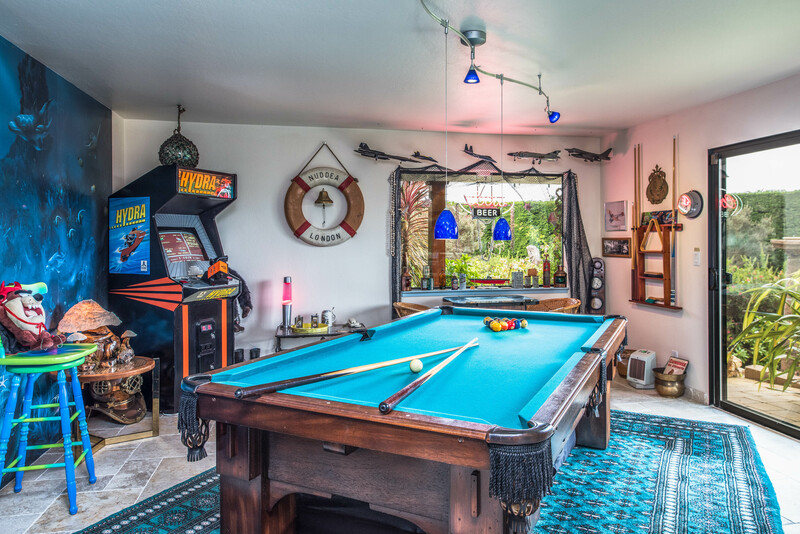 Room has pool table & video arcade games, with sliding glass door to deck, shares full bathroom in hall - Floor space available on 3 sides of pool table for 1 or 2 Twin XL folding beds and/or 1 or 2 Twin futon cushions.